We’ve all seen the commercials and the online ads for do-it-yourself Wills, Trusts and even Powers of Attorney. There are no shortage of assurances that first, you can save hundreds (or thousands) of dollars and second, that it’s as foolproof as what an estate planning lawyer in your own city could provide. Careful though; the DIY estate planning is risky and could result in massive problems for your loved ones after you’re gone. Whether you’ve downloaded the form for free or it’s cost a few dollars, the price you ultimately pay may result in a bigger financial payout in the future. 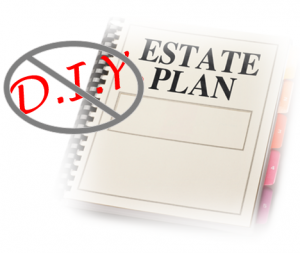 As estate planning lawyers, we’ve seen the repercussions of DIY estate planning. The smallest of details define these important legal documents and overlooking just one of those details can mean big problems. Further, the many customer testimonials that insist the “do it yourself” forms have empowered them and allowed them to no longer worry about their Wills and other estate planning documents are coming from those who will never know how foolproof their efforts were. Their families will know at some point, but it’s irresponsible for these companies to publish these types of testimonials from those whose efforts haven’t been put to the test. The one common denominator most of these websites offer is a disclaimer that their services should not be substituted for legal advice from an attorney. It stops there, though, since many then go on to say legal guidance isn’t really necessary anyway. Many may have heard of the attorney in Minnesota who conducted his own experience with one of the more popular online DIY estate planning sites. He paid $69 for a Will and after he’d received it, he noted that it looked professional and complete; however, knowing he wasn’t experienced as an estate planning lawyer, he posted the Will for others who do practice estate planning to examine. The errors were many. Remember, these are errors that a lawyer had overlooked – not because he wasn’t a fine lawyer, but because estate planning isn’t his specialty. No inclusion of an alternate trustee should his named trustee die before him (Remember, this is exactly what’s happened with the now-public Robin Williams estate). The way the documents were created, it would have disinherited his older son because his new wife would have received everything in his gross estate. This isn’t what he wanted, yet it’s what he received. There was no guidance about beneficiary designations on non-probate assets which would likely pass outside the constraints of the will. Also, there was no spendthrift provision in any of the trusts. These protect trust assets from the trust beneficiary’s creditors. This was just a few of the quagmires that many Americans would need to consider. Finally, you’d be surprised to know just how few lawyers are behind these DIY estate planning and other legal document websites. None that we’ve seen, including the “big name” websites, are actual law firms, which means they’re not legally permitted to review any of your legal documents to ensure they would stand up to your state’s laws. In other words, you’re on your own, despite their best assurances. The truth is, estate planning isn’t as expensive or time consuming as some of these sites would have you believe. If it’s true peace of mind you’re looking for, consider the benefits of an Ohio estate planning attorney – one who knows about the actual laws.